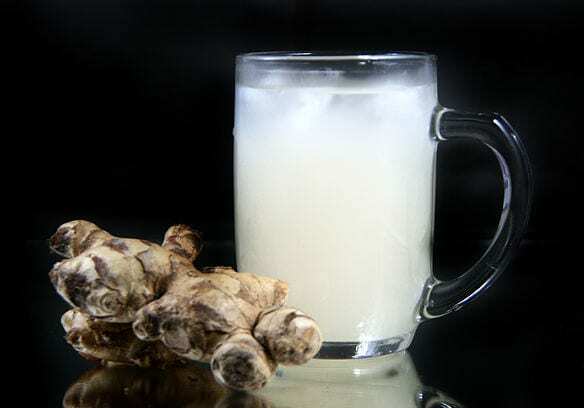 Home » Crafts » Cuisine » Popular Articles » An Online Magazine is Like a Ginger Beer Plant! An Online Magazine is Like a Ginger Beer Plant! Do you remember ginger beer plants? When I was a kid, everyone made their own ginger beer. We all grew used to hearing a sudden bang as a bottle top shot out of the bottle, in the pantry or under the stairs. They died out though because when people made the ginger beer after a week, there was no-one left to give half of the plant to! Now ginger beer is popular again, so why not make your own for a few pence, using fresh ingredients instead of paying a lot for chemical copies? It’s not really a plant. I don’t know why it’s called that. Maybe it’s because it grows every day. First, make the Wild Yeast Culture. You don’t need to buy yeast as there’s enough natural yeast in the air to do this. Two heaped teasps ground ginger. Place in a sterilised jar and cover it with a cloth so that the natural yeast in the air can help it to come alive..
Feed it with two heaped teasps sugar and two heaped tsps ground ginger. After a few days it will start to bubble. Then you’ll know that it’s alive-alive-oh! In a large saucepan, dissolve 700g (1 1/2lb) sugar in 1 litre of water. Bring it to the boil. Turn off the heat and add 250ml (9fl oz) lemon juice and a further 7 litres (15 pints) cold water. Stir in the yeast plant. The water will be cool enough not to kill it. Strain the liquid through a cotton cloth. Gather the ends together and twist them gently until just the dry plant is left in the cloth. Split the residue in two and place in two jars. Add 2tsps of sugar and 2tsps ginger to each jar. The jars will be OK in the fridge for several weeks, until you’re ready to start another batch. Pour the strained ginger-beer into clean bottles with screw-on tops, not corks! Leave them somewhere cool, standing upright for at least two weeks to clear and mature. This makes about 22 bottles of ginger beer. There are of course different variations of this recipe. The sugar that you use will vary the taste. Some of them use bought yeast. But, like making sourdough, why buy it when you can make it? So why is my online magazine like a ginger beer plant? Because it needs feeding every day! Halloumi Cheese! A selection of delicious recipes for you to try. Smoke Gets in Your Pies! « Shelly Beach Snippets. 5th January 2014.